A cornerstone of Plunkett Cooney’s business involves ongoing training and career development for all its employees. Attorneys are encouraged to attend continuing legal education programs, at firm expense, to keep current on specific legal issues and trends in the law. Additionally, the firm offers in-house legal training sessions provided by our own expert attorneys on substantive areas of the law and other topics such as legal writing, research and marketing and business development. Our attorneys also take advantage of firm sponsored memberships in legal and industry organizations that provide conferences, workshops and seminars. 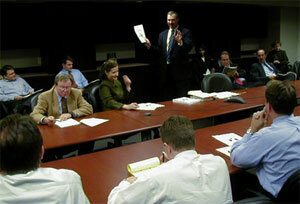 Paralegals and members of the firm’s administrative and legal support staff have similar learning opportunities. Among Plunkett Cooney’s internal staff training offerings are computer software, office organization, client service, team building and practice development. The firm also offers life skills learning opportunities on an array of topics ranging from CPR/First Aid/AED certification to personal financial investment.